Created in 2006, Oopah Brass are an extraordinarily talented classically trained brass quintet who met at the Royal College of Music. They started out in the german themed clubs and pubs of London playing bavarian oompah music, as a way of paying off their student loans. But they soon began to find playing traditional waltzes and polkas rather dull, so, in a flash of inspiration, they decided to arrange and play classic pop, soul and rock songs with an oompah beat and a bavarian swing, thereby creating the first-ever Oom-pop but, most importantly, still keeping their bavarian themed gigs! This proved to be extremely popular and has led to the fantastic success they now enjoy. 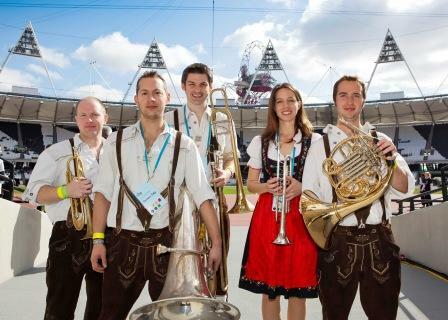 Other musicians have tried to copy them since, but nobody comes close to Oompah Brass. They now regularly support comedians live on-stage - they recently played for Al Murray, Frank Skinner and Ross Noble during their respective London shows. They also perform in theatres, concerts and festivals all over the world. And at corporate events: ranging from awards ceremonies (where they often play walk-up music for the winners, as well as playing a cabaret set) company jollies and parties to product launches. They play at weddings, bar mitzvahs, (and indeed, bat mitzvahs), birthday celebrations, anniversaries and other joyous family occasions, where their brilliant and uplifting warm brass stylings add greatly to the jollity and fun. In 2012 they won the prestigious Haizetara International Street Band Festival in Spain, receiving the accolade of "Best Band in the Festival" and a prize of 10,000 euros - their french horn player, Sam Pearce, was also voted "Best Musician in the Festival". They have performed on Radios 1,2,3,4,5 and 6. Also on BBC TV, ITV and Channel Four. The band played at the Royal Festival Hall last year with a full symphony orchestra and choir. Even without amplification they were louder than all of them! For a band like no other, introduce yourself to the magical world of Oom-pop with Oompah Brass! "The Legends In Lederhosen - they rock - so good"
"A rock'n'roll oompah band. Tremendous!" "Totally spectacular, thrilling. It's not a gimmick, it's a fantastic sound. It's got legs like you wouldn't believe." "Fantastic, they left me breathless."